Weirdly enough, I'm also looking for a design to put on a shirt for fundraising haha. 100% of the proceeds will go to Japan of course. Send me a message if you're interesting in collaborating! is that word says "pray"? Its the Japanese symbol for "God". Thanks! This is really nice of you, I featured it here on my blog [link] if you don't mind. Thanks. Hello! Thats really nice pic! Can I post your　message　on my japanese blog? I heard, many Japanese people said Thank you soo much. Ill keep posting many messages from all over the world. That means so much to me! I'm glad I could put smiles on peoples faces in such hard times! The pleasure is mine, thank you! 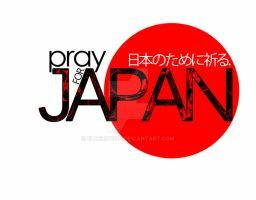 lol i should've made the type say "pray/hope/think about/support/donatetoredcross for japan"
We all pray for them. Sick work, man. Awesome textures. I really like the look of the wave, as well.